Recently I was sharing a story about the time that Cazandra told me that we were going to have our first child. I related the story to a fellow staff member at my church. As I shared with her the story of how I told my mom about this new journey that we would begin together, I felt overwhelmed by a flood of emotions. I was taken aback by how I was feeling in retelling that story. What caused me to connect so profoundly to the announcement of my son’s impending birth? Was there something that I had not recognized about the dramatic changes that my life was about to experience? Why now? Why so emotional after all these years? He wasn’t born yesterday. His eighteenth birthday is still a few months away. Maybe the realization that he will be an adult is leading to a heighten feeling of nostalgia regarding his life. Perhaps it could have been a quick moment to remember my mother. I know that she loved my children well and was a fantastic grandmother to boot. Maybe my emotional response came from a place of sadness as life goes on without my mother’s physical presence. Her silence speaks loudly into my life. One of the most important places in which she speaks is her absence in my children’s lives as they will not be able to build new memories with their “Granny.” I know my mom still lives on in spirit, and I know that the joy and love that I share for my son are interwoven with the love that I have for my mother. And as for me, I went back to my office and gave a prayer of thanksgiving for that big stinky boy that I have been honored to raise. I gave thanks for his presence in my life and will continue to thank my God for this particular person that I call my son. His talents are great and his heart is even greater. There are people, places or things that connect us to the most intimate part of ourselves. The part that reflects upon the greatness of God. My son is the reminder of the Divine love that I have in my heart and the overwhelming gratitude to God for being trusted to raise him. I try to make sense of how I was qualified to raise a child and I must say that I agree with the Psalmist when he says, “That kind of knowledge is too much for me; it’s so high above me that I can’t fathom it” (Psalm 139:6 CBE). Whatever the reason may be, I am eternally grateful. And as far as the picture, this is him in his element: His love of the theater shines through his eyes despite the green makeup. 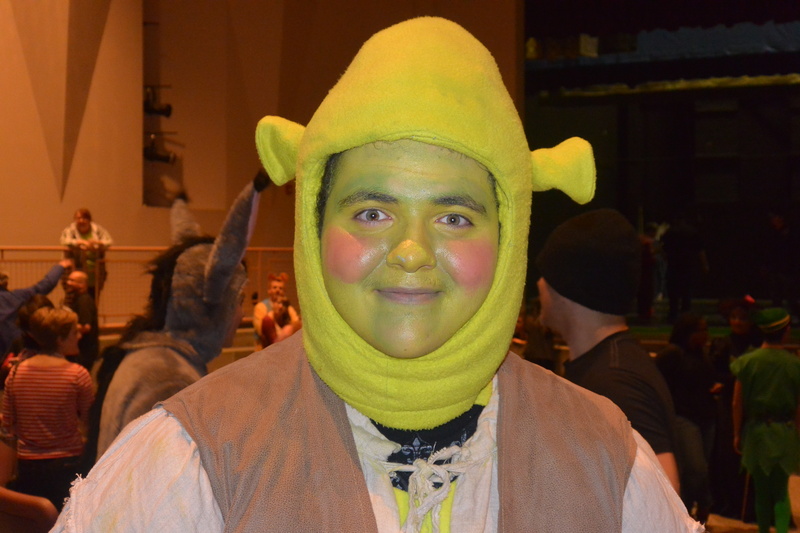 He played the title role in Shrek at his high school. His voice is so much better than mine. He has a nice beautiful tone that just flows naturally from his mouth. To watch him on stage is pure joy. I am so glad that he is able to follow his passion. Onstage Mr. MacDonald is fearless. There is no doubt where he should be. How blessed am I to watch my child delight in his calling. Today I am filled with gratitude for the love that is now and for the love that I have had. I eagerly look forward to the future and the amazing things that await my son as he continues to astound me along this journey. This entry was posted in Christianity, church, Faith, family, Parenting, praise, psalms, Uncategorized and tagged Christianity, faith, Family, Parenting. Bookmark the permalink.